Last month, we launched three massive open online courses (MOOCs) in Arabic with our partners at Coursera. As a result, the nearly 300 million Arabic speakers around the world now have access to courses on Leading Teams, Programming for Everybody, and The Science of Success. This spring and summer, we will launch seven additional courses in Arabic delivered on the Coursera Platform. We are also partnering with edX to translate courses into Spanish delivered on edX’s Spanish language platform. We will start this journey with Programming for Everybody and create additional learning opportunities to meet the needs of Spanish-speaking learners across the United States and around the world. Previously, we translated a course on Successful Negotiation into both Spanish and Portuguese through our partnership with Coursera and have reached more than 110,000 learners to date. All of these courses are made available to learners on Michigan Online. Imagine a destination for lifelong learning, better yet, a destination for lifelong problem solving. Significant problems. Problems that matter to diverse, global populations. What do you need to solve these problems? Knowledge, skills, and people. Scaffolding to support interactions. A sense of community. A shared purpose. To solve the most important societal problems, we need problem-solving communities made up of learners that reflect the diversity of the world around us. Unfortunately, most learning communities fall short on many dimensions of diversity. So what is standing in the way? In the current digital era, we often start by removing the barriers of time and space. We create self-paced, asynchronous, and near synchronous learning experiences. We develop tools to personalize learning, support collaboration, and close distance. We quickly find ways to lower these barriers with smart technology choices and shift our collective thinking about reach. Next, we tend to look beyond our massive reach and see positive gains on many dimensions of diversity. At the same time, we realize that we can do much more. Relaxing time and space gives us a new lens and inspires institutions like the University of Michigan to think differently about our ability to expand our public purpose. As we build upon experiments in the only way we know how, informed by data and scholarship and in the interest of advancing learning, we see additional barriers in the form of access, belongingness, and affordability. We haven’t solved for higher education deserts, helped learners at all levels to see themselves in higher education environments, or sufficiently experimented with business models to reduce costs to learners. There is more to do here and experiments are underway. But there is at least one more important barrier to lower in addition to time, space, access, belongingness, and affordability: Language. In a world of near-limitless access to knowledge, and with learning tools that are improving every day, we understand that increasing access to learning opportunities is essential, but also insufficient. We must provide opportunities to learn together. Language is one tall barrier that stands in the way. Since launching our first MOOC in 2012, We have surpassed more than 7.3 million enrollments with learners from nearly every country. This new network of learners objectively alters our community diversity. At the same time, we see significant opportunities to make larger strides forward in areas of diversity such as socioeconomic status, educational attainment, and cultural identity. We believe lowering the barriers imposed by language is part of the solution. We know that more diversity leads to better problem solving. Just as we’ve designed experiments to lower other barriers, we are now pointing resources toward language. Translations are only the beginning. We need to imagine and design learning environments and enabling tools that engage and empower learners and facilitate sharing, understanding, and problem solving across this boundary type. We need a multilingual destination for learning and problem solving. As we move beyond translations we will explore new modes of learner-centric design, including the development of original learning content in the language and context of specific communities, which will help all our learners develop cross-cultural competencies, and position our global problem-solving community to address grand challenges. It is these grand challenges that require problem-solving teams made up of curious learners that together posses deep knowledge, skills, and lived experience. These problem solvers are evenly distributed and language is a significant barrier to constructing the universal and compassionate public square our world so desperately needs. In the near term, we hope to open our doors to more learners around the world in order to strengthen the diversity of our community. We will start with on-ramp courses and our Teach-Out series to provide new opportunities for learners to access our community and level-up in certain areas. Ultimately, we aim to facilitate opportunities for these learners to put knowledge and skills into action. Imagine there’s no barriers. It isn’t hard to do. We want aspiring problem solvers to be able to learn with and from each other, to create new learning experiences and tools that bring us closer together, to create new knowledge and a better world. It’s important to note that the near-term benefits of translation will be realized close to home as well. Let’s go back to the example of courses translated into Arabic. The population in Michigan who identified as having Arabic-speaking ancestry on U.S. Census surveys grew by more than 47% between 2000 and 2013. With an Arab American population of more than 223,000, the State of Michigan ranks second among all U.S. States and is among the fastest growing Arab populations in the country. There are particularly large concentrations of first-language speakers in cities like Dearborn and Hamtramck. Michigan has also been one of the most welcoming states when it comes to accepting refugees, particularly those from Iraq, Syria, and Yemen. Creating these new learning opportunities in Arabic provides an immediate opportunity for U-M to impact the lives of Michiganders and to open channels for U-M to learn from the individual and collective experiences of an important constituency in our State. 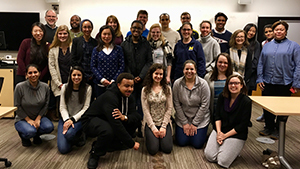 We also create new learning opportunities for U-M’s students, faculty, staff, and alumni in Ann Arbor, Flint, and Dearborn as translated courses provide language-learners and bilingual students with valuable opportunities to practice new skills in domain-specific contexts. We are excited about the potential of this new area of focus and hope to see more compelling projects initiated through a new call for proposals shared with University of Michigan Faculty and Staff. On March 8, 2019 we launched a new call for proposals designed to expand equity and inclusivity in U-M’s academic innovations. With this call we see opportunities to increase access to the scholarship, learning experiences, and technologies created at U-M. We invite proposals aligned with our mission of supporting diverse learners and the creation of inclusive and equitable learning experiences. This is the fourth blog post in a series on the School of Education’s 2018 Winter Cohort initiative. 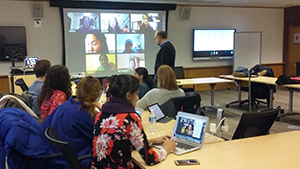 In the first post in this series, Professor Donald Peurach introduced the 2018 Winter Cohort: a learning experience in which University of Michigan graduate students collaborated with online learners from across the globe to complete content from the School of Education’s MicroMasters program in Leading Educational Innovation and Improvement. In this post, Cathy Hearn takes the 2018 Winter Cohort as case study for the ways in which we can harness educational innovations to further the causes of democratizing and diversifying higher education. Through the 2018 Winter Cohort, the course team strove to provide an accessible, flexible experience, enriched by the perspectives of peers from across an impressive range of national, cultural, and professional settings. The rise of online learning brings with it the prospect of dramatically widening access to education. When this education is designed and delivered by a team at a world-class university, we are talking not only about access, but also about quality. Online education from institutions like the University of Michigan has the potential to provide equal access to a high-quality educational experience to anybody with internet access and a smartphone or computer, where in the past, access to such resources was hindered by barriers of a financial, geographic, social-cultural, or other nature. Approximately 11% of the University of Michigan student population are foreign nationals (2015); by contrast, our 2018 Winter Cohort learners came from across five continents. While we did not collect financial data, this geographic range—coupled with the fact that online learners could take the course for free or at a low cost—likely meant our class was more socioeconomically diverse than most at the University of Michigan. Further, our course provided learners across the globe with an opportunity to access knowledge, advanced largely in well-resourced American research institutions, and adapt this learning in support of their local settings. In my view, two important priorities across all higher education teaching should be: (1) the inclusion of students taking non-traditional pathways, such as those working full-time or those with children, and (2) the support of learners with diverse learning preferences, including those with learning disabilities. As expected, the majority of our off-campus learners outside of Ann Arbor held jobs alongside their studies, and many spoke of families and other commitments. We also found a significant segment of our Ann Arbor-based learners were also working in addition to their studies. Potentially, they were attracted by the fact that we held class sessions for Ann Arbor-based learners triweekly, and a start time of 5 p.m.
One of the strengths of this learning experience was that learners felt the agency to shape their experience into a form that matched their preferences and aspirations. Opening up our classroom to learners from across the world meant opening up our learners to a diversity of perspectives that served to nuance, challenge, and enrich the learning experience. While diversity manifested itself in a variety of ways, it ultimately amounted to a richness of thought and perspective that would have proved difficult to replicate in a fully residential environment. As the University of Michigan continues to establish its status as a university with a positive global reach and impact, I hope we continue to recognize the fact that our international learners are valuable contributors to a richer learning environment for all students. I’m keen to note that while aspects of identity such as race or socioeconomic status are rightly central to many discussions of diversity in higher education, several of our learners chose to disclose their identities to course colleagues in terms of their professional backgrounds or countries of origin. Since our learners were not required to upload profile photos, disclose financial information, of use their names in their edX user identities, racial and socioeconomic aspects were less immediately apparent in the online portion of our class. In this way, we have discussed the possibility that phenomena such as implicit racial, gender or (dis)ability bias were perhaps slightly mitigated by these features. Are our course materials too US-centric, or can they be made more relevant for our learners from global contexts? Are there ways that we can empower learners through the creation of such content? How can we make sure that we are accessing learners who could stand to benefit the most from our course? How can we support learners in developing the skills necessary to persist and succeed in a demanding online course? Are there ways that we can ensure that our courses can be easily adapted by learners with different learning preferences or ability statuses? Online and hybrid courses like ours provide exciting possibilities for welcoming an ever-wider range of learners to a world-class education. Pushing ourselves to ensure our courses welcome, reflect, and embrace this diversity means pushing ourselves to create a stronger learning experience for all participants. Connect with the School of Education MicroMasters team: @UMLeadEdHub. Six years ago, inspired by a big idea to democratize higher education, the University of Michigan (U-M) became a founding partner of Coursera. Massive open online courses (MOOCs) were born. While the issuance of MOOC death certificates by skeptics is only rivaled in frequency by those filed by South Park writers for Kenny, MOOCs consistently find ways to survive and indeed thrive in nurturing environments. MOOCs are far from dead. Rather, they appear to hatch derivatives. Sean Gallagher of Northeastern University’s Center for the Future of Higher Education and Talent Strategy refers to this as “the new ecology of credentials”, a landscape transforming rapidly as we move from the early knowledge economy to the digital, AI, Gig economy. Which leads those of us close to the action to reflect often upon the original big idea for MOOCs. Typically stating a goal to “democratize” is followed by “access to” something. In hindsight, it’s clear we hadn’t fully considered the potential of what we might be democratizing. What, in fact, are we scaling? Is it content and courses? Curriculum and credentials? Communities and college towns? With today’s announcement, we are now much closer to saying “all of the above”. MOOCs may have initially provided learners an opportunity to simply peer into the university. Now MOOCs and MOOC derivatives (e.g. Teach-Outs, specializations, MicroMasters, MasterTrack, etc.) are helping universities to expand how they think about engaging with the world. For U-M, this is entirely consistent with top institutional priorities around academic innovation, diversity, equity, and inclusion, and public engagement. We are the global, inclusive, public research university. Today U-M announced the intent to design two new fully online master’s degree programs and a new online cohort-based pathway to advanced degrees and career advancement called the MasterTrack Certificate. Let’s consider this latest re-bundling effort within the broader context. U-M seeks to address global problems in pursuit of a more equitable world. If we can agree that global problems do not fall neatly into the academic disciplines, it should follow that the increasingly diverse needs of learners would be difficult to address through a set of unmalleable academic offerings. If we are serious about diversity, we need to be equally serious about inclusivity as we design new programs, and laying a foundation for learners with vastly different starting points, learning styles, and learning objectives. So in 2012 we began to adopt ‘unbundling’ as part of our language. Many chose the fear narrative and heard unraveling. We chose the opportunity narrative and have been re-bundling ever since with an evolving mix of learner-centric offerings. Because experiments regularly fork into new experiments, it is easy to lose focus. As we move at a rapid speed, we find it is critical to anchor in our vision for a preferred future – one that points U-M in the direction of expanding access, designing for inclusivity, personalizing at scale, and reimagining two-way public engagement. We took a major stride toward this future today by announcing two new degrees and pioneering the MasterTrack offering. Along with our MOOC portfolio, our expanding Teach-Out Series, and our MicroMasters programs, learners have more opportunities than ever to be a part of a Michigan learning community. We’re just getting started. And the world future of work and future of learning show no signs of slowing down. Given what is known and all that is uncertain, our goal is to build a global, inclusive, public research university that is future proof! As we move toward this future, it’s clear that there is a time for acceleration and a time to struggle through experimentation – advancing learning and recording failure along the way as only Universities do. And now, an adorable tangent on barriers to entry, speed and pace. My six-year-old daughter is beginning to love soccer. Before each practice, I ask her how she will train today. She pauses predictably, smirks and tilts her head to the right, and with one eye visible responds, “like a cheetah-rocket!” Never heard of one? Well, for those who haven’t spent time with a six-year-old lately, these are two things that are, like, really fast. So when you put those two things together, it would stand, that you get something even faster. When my daughter first showed signs of doubt that she could compete with the “big kids” (seven and eight-year olds are Goliath to a six year old David), we focused on getting in the game. She needed to belong. We talked about the way she would enter the pitch. After some epic brainstorming, she refused to choose between ‘like a cheetah’, and ‘like a rocket’. “A cheetah-rocket would be faster, Dada,” she stated decisively. She’s now in the game. She wants to try and she know she can. She’s ready to learn. I think about our learning curve on the soccer pitch often as the higher education industry evolves with competing narratives of opportunity and fear. At the moment, I’m helping my daughter to gain confidence. Soon I’ll need to help her understand that learning is hard and that part of the human experience is to struggle through new lessons. We’ll need to slow the game down to understand each component. Speed and learning don’t often go well together. We are steadily lowering the barriers to entry in higher education. We unbundle to grant cheetah-rocket speed to all. Access, belonging, opportunity, personalization. As we re-bundle, we need to create new opportunities that advance learning rather than enable the tyranny of convenience. This will take serious experimentation in order to establish the best mix of learning opportunities and credentials for the economy ahead. With my daughter, I need to help her slow down and understand the fundamentals at her own pace in order to lay a sound foundation for learning. Similarly, MOOCs provide a foundation for self-paced learning. As we continue to experiment, we need to make sure this foundation is flexible. Importantly, for universities in this moment, it turns out that speed as a lever goes in multiple directions. Universities need to continue to gain comfort with good risk taking. A burst of cheetah-rocket speed now and then can help us to accelerate experimentation in pursuit of our ultimate goals. Yet we also need to apply good methods and R&D principles to make sure we pace ourselves when appropriate and ultimately reach our desired destinations. Do we have the confidence to set the right pace and embed good pedagogy as we continue extend our reach? We have made significant progress in expanding our reach, but we haven’t yet cracked the code on embedding good pedagogy at scale. This will be a primary focus in the next wave of experiments. For U-M, we’ve envisioned a preferred future that allows us to be more global, more inclusive, more public. Many ways in. Several ways through. Clear outcomes and value. Today we took another step forward in the great re-bundling and it is clear that there is a long road ahead. Good things take time. As we continue to experiment and design learner-centric programs and learning communities, we intend to make design choices that support informed decision-making for learners, increase affordability, increase acceleration, increase frequency and quality of feedback, and replace a capstone mindset with project-rich learning experiences throughout. Given what we expect in the future of work, can we create pathways to continuous competency? How will our evolving product mix fit together for different kinds learners? Is there tension between access/on-ramps and deep learning? How should we incorporate real-world projects into rich, rigorous, and agile curricula? How will employers evaluate sub-degree credentials? What are the best ways to engage learners and employers in the design of learning experiences? Are we addressing the audiences that need us most? So what are we democratizing? It turns out for U-M, our efforts are focused on scaling the great public research university in pursuit of a more equitable world. Neither MOOCs nor degrees are dead. Instead, we have entered an era of experimentation that will result in a new collection of credentials needed in a future where, as Mark Searle, Arizona State University Provost said so memorably in his keynote this morning, “universities are known for who we include not who we exclude”.